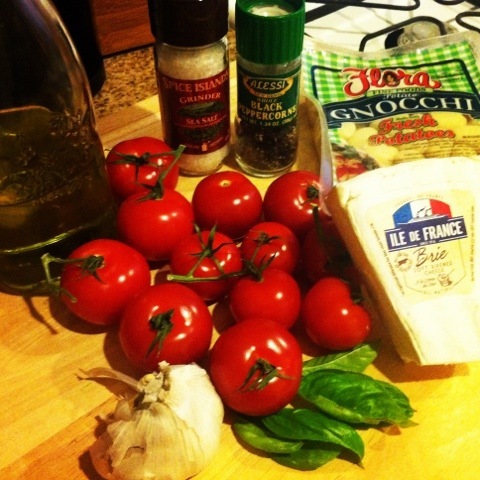 You are here: Home » Gnocchi with fresh tomato sauce, basil, and brie! 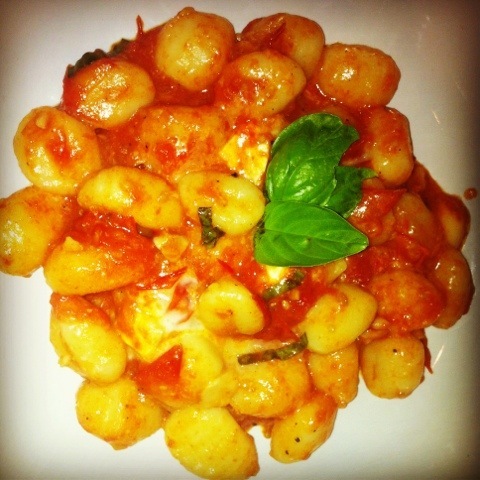 Gnocchi with fresh tomato sauce, basil, and brie! There are great weekends, and then there are GREAT weekends. This past weekend fell into the category of a GREAT weekend….epic, in fact. Every year in March, thousands of tourists descend upon Miami for Winter Music Conference and Miami Music week. If you’re an electronic music fan, like I am, and you haven’t been to Miami during this time–ummm, what are you waiting for?! DJs from all over the world play at pool parties, outdoor festivals, clubs, lounges, and bars and Miami is full of an indescribable buzz and energy. Pretty much it’s one big party and man, I’m happy it only happens once a year or I might be in trouble. 🙂 I had a friend in from Italy and decided to take a mini 4 day stay-cation. I know, I know–I just had a week off from work, but I wanted to show my friend around Miami and be able to attend some events. Sue me. I met some amazing people from out-of-town and got to hang out with old friends and just enjoy each other’s company while being surrounded by some great music. This was one of those weekends that years down the road when you’re sitting around with these same people (and I sure hope I am!) that you say, “Remember WMC 2012 when……” Needless to say, I didn’t set foot in my kitchen and meals were consumed on the fly while rushing from event to event! So here I am trying to adjust (again) to the routine of work, gym, and cooking while already scheming about where my next vacation will take me. Last night I was craving some comfort food and gnocchi and fresh tomato sauce does the trick for me. I needed something healthy, easy, and tasty and this recipe fit the bill! I had some brie lying around and decided to throw it in there and it was a cheesy, tomato-y heaven! If you’re making a tomato sauce from fresh tomatoes, it’s so, so, so important to get some good tomatoes. And please!! Don’t put them in the fridge when you get them!! Refrigeration is the enemy of tomatoes. It dulls the flavor because refrigeration breaks down a compound that accounts for taste and scent. Bottom line-just don’t do it! I really like Campari tomatoes when I’m making anything with fresh tomatoes. They’re sweet, juicy, and they tend to not have that mealiness that you find in “slicing” or “globe” tomatoes (those regular, tasteless tomatoes). If you can’t find Campari tomatoes plum tomatoes are okay as well. Just make sure they’re ripe. Put some salted water on to boil for the gnocchi. In a pan, heat up some olive oil and throw in your garlic. Let it cook over medium heat for a few minutes being careful not to let it burn. Throw in your tomatoes and the magic ingredient–salt!! Salt breaks down the tomatoes and creates that nice sauce texture. See the lil’ nifty photo collage (fancy, huh?) 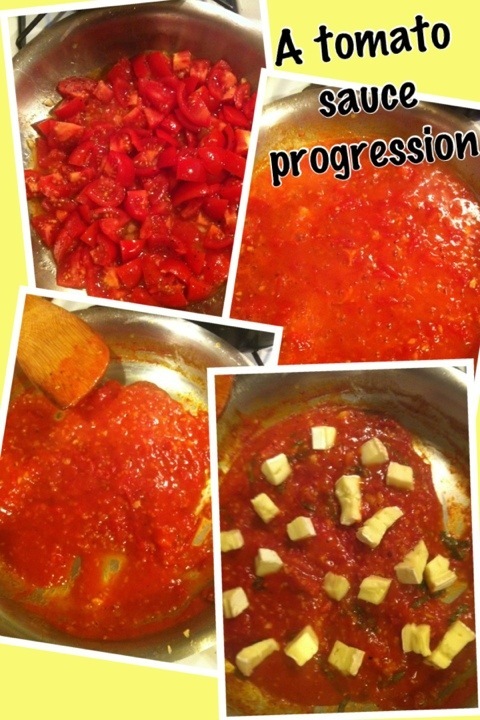 below to see how the sauce progresses from raw tomatoes to a thick texture. Once your sauce is almost done, throw your gnocchi in the boiling water. These only take about 5 minutes to cook. When your gnocchi start to float to the top of the pot, they’re done! Toss your cubes of brie in the sauce and your basil. Dump the gnocchi into a colander and then combine with the sauce. Serve immediately or your cheese will become gummy! Campari tomatoes are so delicious. I will be making this recipe tonight without the Brie because I don’t have any and the hubs isn’t crazy about Brie. how did u get your tomatoes to become like that sauce in so little time? did u use a mixer? u r the tomatoes sauce’s queen. I tried to make it and it was not as good as yours. what type of tomatoes do you use again? It just did not have much flavor. I think it bc of the tomatoes. I have found that 1 or 2 anchovies thrown in the sauce can give it a deep, rich umami taste without any trace of fishiness. Anchovies can take a good sauce and transform it into a great sauce.